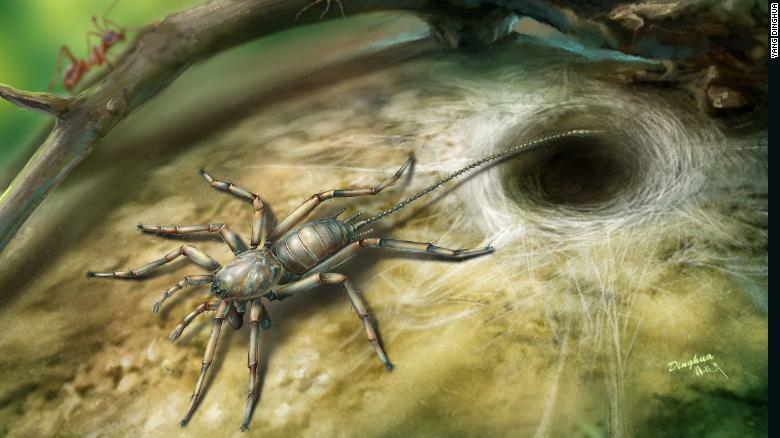 (CNN) — Scientists have discovered a groundbreaking arachnid species that lived millions of years ago — and it had a tail. The tiny creatures were less than 3 millimeters long and crawled around Southeast Asia about 100 million years ago, according to a paper published Monday in the journal Nature Ecology & Evolution. The species is being called Chimerarachne, a riff on Chimera, a fire-breathing hybrid creature found in Greek mythology. Paul Selden, Director of the Paleontological Institute at the University of Kansas, coined the name. Like a Griffin or a Jackalope, the spider looks like it had a tail from another creature attached to it. A few years back, Selden and colleagues published a paper about a spider-like creature with a tail from the Paleozoic Era. The Chimerarachne are much younger and also have spinnerets, a spider’s silk-spinning organ. “Suddenly, here was something that formed a missing link between our ancient prototypes and the living spiders,” Selden said. The Chimerarachne show that Uraraneid, an extinct lineage of arachnids, co-existed with their spider relatives for at least 200 million years, far longer than scientists originally thought. This means that they survived the mass extinction at the end of the Permian geologic period, some 252 million years ago. Studying primitive spiders is tricky because they lack an internal skeleton, which means they don’t fossilize well. The Chimerarachne turned up in Burmese amber, one of the few materials conducive to spider fossils. “Amber preserves the external structures — and sometimes even the internal structures — of fossil arthropods in such fine detail that these ancient species from nearly 100 million years ago can be described in nearly as much detail as a living spider,” Dr. Greg Edgecombe, a researcher at the United Kingdom’s Natural History Museum, told CNN in an email. There is no way to tell if the spider is venomous, since the Chimerarachne’s fangs aren’t large enough to examine. If more specimens emerge, Selden and others hope to find out more about the spider’s anatomy, behavior and whether it has a female counterpart. So far, they only have found males. “When you find the missing link, you just create two new gaps where previously, there was one. So, we hope to fill in more of the story,” Selden said. Even though these fossils are millions of years old, scientists say that it’s possible that tailed descendants of the spiders are still alive in the backcountry of Myanmar, the country formerly known as Burma. Afraid of spiders? Fear not. Given the Chimerarachne’s infinitesimal size, you’d probably need a microscope to spot its kin.